What an operation in the Abbottabad! The elimination of Osama bin Laden reads like a thriller. And it was. It was run by elite Navy SEALs attached to the Joint Special Ops Command (JSOC). This particular group specializes in sensitive and risky assassinations and, in my opinion, if used with judgement, is the most effective weapon in the asymmetrical warfare against terrorism. One U.S. Military source describes them as “Sort of like Murder Incorporated” with a business of killing terrorist high value targets. Murder is a heinous act and for a long time we have forbidden it as part of U.S. war options, as being contrary to our values. In very special cases, however, it is a very efficient alternative. Imagine if we had killed Hitler in 1939! It was impressive how well the Abbottabad raid was thought out and executed. First the painstaking gathering of intelligence with hundreds of our spooks clandestinely on the ground in Pakistan – in an environment where you must build trust very carefully, and where your counterparts in the Pakistani Intelligence are highly unreliable and even helping/shielding elements in the terrorism’s high echelons. Then the meticulous planning. 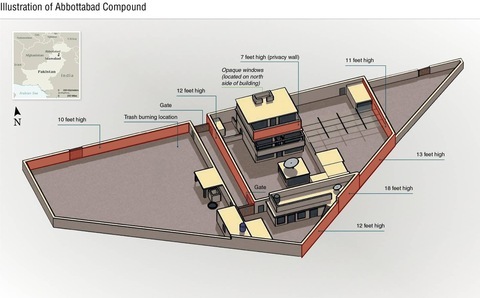 The building of a mock compound in a hidden location in Afghanistan to train for the raid and plan out all contingencies. Finally the operation itself. Middle of the night. Two helicopters flying into Pakistan from Afghanistan. The Pakistani authorities not informed about the details and timing of the op. The whole precision strike and abduction of the body plus the careful collection of all information found on the compound took only 40 minutes. Toward the end of these forty minutes the Pakistani fighter jets scrambled as they sensed something was going on. The SEALs had to avoid them and make a run back in their remaining craft. There was even talk that they were prepared to shoot down Pakistani airplanes if the desperate need for that arose. A daring and brilliant execution! It took us 8 years to piece together enough intelligence to capture bin Laden. Why so long? Clearly this is a very difficult business – and bin Laden and his men were very good at countermeasures. But there is no doubt that he was being shielded and protected by some high-ups in the Pakistani Army and government. I remember when Osama first ran to Pakistan with us in hot pursuit from Afghanistan, Pakistani president Pervez Musharraf announced that he was dead from a kidney disease in order to throw us off. Ever since, many elements in Pakistan have deliberately tried to steer us away from him while they have kept him one step ahead of our pursuit. They have repeatedly said that he is not in Pakistan or hidden in very remote caves about which they have no information. But we have been persistent in dealing with Pakistan – understanding the difficulties that they have with their torn loyalties and a dominant Army/Intelligence culture that has fostered and built much of the terrorist dragon that now comes back to haunt them. We have understood how many in Pakistan do want to support us, either through understanding the benefits of aligning with us or through realizing the much worse consequences of picking up an open fight with us. We have used the carrot and the stick – given them aid, have joint military programs that boost their military and kept them from being a pariah state such as Yemen, Somalia or even Syria might be becoming. We have even offered them state-of-the-art technology, such as the drones unmanned aircraft and all the smart tech that goes with it. We hope, of course, that Pakistan will be swayed to join our bloc of democratic, secular, open societies and not gravitate toward the lure of the theocratic or the autocratic, like China, with whom they have nothing in common but have a solid alliance based on their diverse goals and ambitions in the region. Pakistan was certainly a key (though hesitant and partly coerced) partner in making this operation against Bin Laden successful. It would be great if one of the consequences of this event is an even greater confidence in Pakistan that they can turn the page on their terrorist-haven reputation and join the world order of open, flourishing, democratic countries. Maybe join hands with India with whom they share a wealth of culture and history and move forward together into the 21st century as a major cultural bloc of people in the world. But, for now, the U.S. took charge of the situation. Full marks to President Obama who, as soon as he took office, moved the elite JSOC teams from Iraq to Afghanistan and fully authorized them to target Bin Laden. With his great team (Patreus, Panetta, Bob Gates and Hillary Clinton) he fought this war in the way modern counterterrorism wars must be fought. Through intelligence and Special-Ops and precision targeting as opposed to an Iraq-style invasion. There are only 2500 SEALs in the U.S. they work for the Navy and the Marine Corps. Our defense policy and spending for the future should be more geared to building up our asymmetrical war fighting capabilities: Much higher emphasis on Intelligence, elite ops groups, high-tech listening and data gathering using drones and the like, lots of local language speaking assets development etc. Had we built this kind of capabilities after the first Iraq war (under Bush Senior) we would not have acted with the poor intelligence regarding Weapons of Mass Destruction leading up to the second (and disastrous) Iraq war. We must also develop a greater understanding and respect for the muslim peoples of this world and feel the forces and emotions that move them. We cannot tolerate the heinous radical ideologies that go under the Islamic name but most muslims would not choose them unless they felt afraid and misunderstood. I think that the revolutions in Tunisia, Egypt, Libya etc – the so-called Arab Spring – are democratic, mostly secular and pro-west. In Libya we see the protesters holding up American flags and showing great affection for the pilot of the American plane that crashed there. Egypt too was a relatively secular uprising. No one in these countries is demanding Sharia law or Muslim theocratic states. These are the signs that we can be friends with the Arab street and that they essentially want to belong to our bloc of open democratic societies. Getting all these people into the umbrella of modernism is obviously the best way we can fight terrorism and getting the pan-Islamic radicals to wither away. 1 Response to SEALed and Delivered! Thank you for restarting your blogs – I have missed them. Now that Larry’s folks are gone, I am finally getting to read them. I particularly like this last one – SEALed and Delivered. It does read like a thriller – and you are more than up to the task of delivering a compelling tale. It is wonderful to have some good news. Makes for a welcome change of pace from our constant stream of negative news. I am wondering if your Trojan Horse blog is somehow tied into Pakistan’s role in Bin Laden, however hesitant their help may have been (“Pakistan was certainly a key (though hesitant and partly coerced) partner in making this operation against Bin Laden successful. “). The bigger question here is, with your new found role of daily blogger, will you still have time for golf?? ?